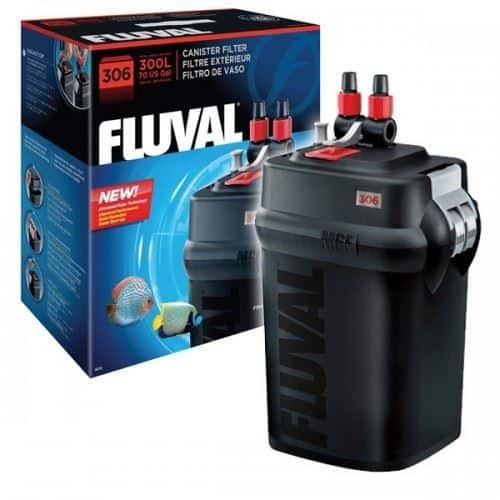 The Fluval 306 canister filter is on the higher end of the Fluval “06” line of canister filters, which also contains the Fluval 106, Fluval 206, and Fluval 406. In comparison to the 106 and 206, this model has increased pumping power. The 306 can handle a 70-gallon tank at a maximum flow rate of 303 GPH, as opposed to the 106s 25MAX/145GPH, and the 206s 40MAX/206GPH. That increased power also comes with greater power consumption (16W) and bigger size (9.5″ x 7″ x 14.4″). Size isn’t always a drawback, however, as this also allows the 306 greater capacity for filtration media, with three separate baskets. In comparison to the 406, it’s obviously a bit weaker (406 has a 100MAX/383GPH capacity) but is still powerful for most hobbyists tanks. The 306, like all of the “06” models, has been designed with superior effectiveness over the “05” models, thanks to an advanced motor that is more capable of handling sustained water flow. Fluval has also stated that there are also additional “user-friendly” features that make the setup and the operation of the tank a bit easier for tank owners of all skill levels. You should bear in mind a few things about their purpose, and what is going to be best for you. 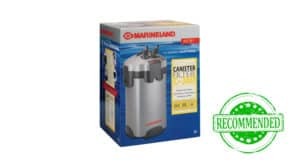 As stated, canister filters are powerful, and well suited for larger and more heavily stocked aquariums as they can support high-level water flow and lots of filter media. The larger and more populated your tank, the stronger the filter you will require. 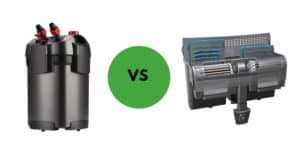 This generally translates to an increase of money you will need to spend, but not always, as there are cases when a less expensive filter can seriously outperform a pricier one on power and efficiency. 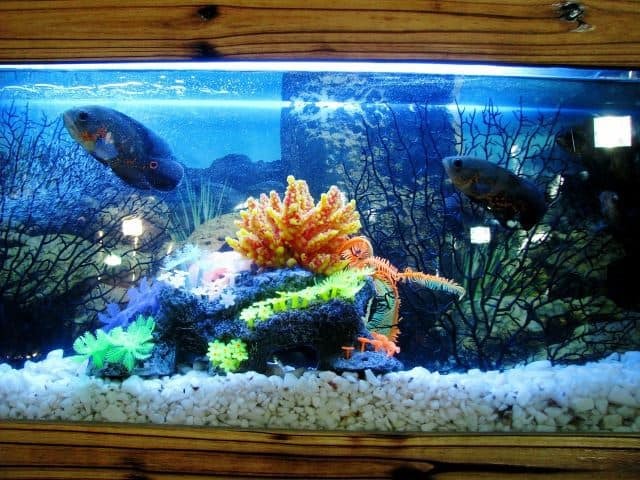 Being an external filter, you’ll need to ensure that your aquarium site can accommodate it. Most of the time a canister filter can fit right underneath the table you have your tank on, but with a much larger filter, that may not be the case. 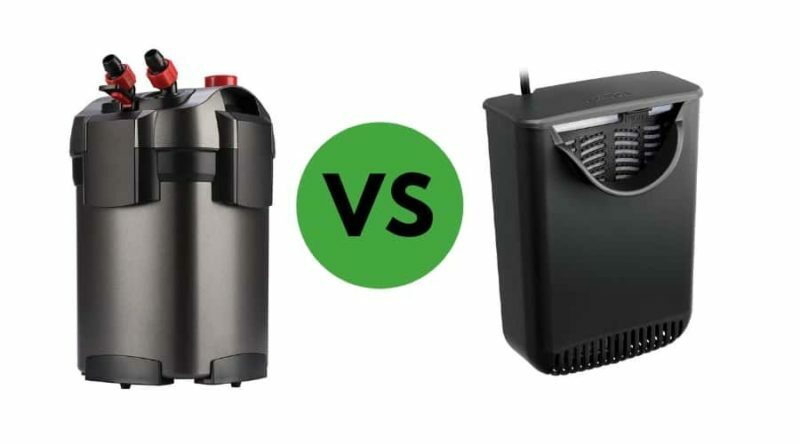 Though they are billed as being quiet and easy to use, that isn’t the case with all canister filters. You will have to factor in the possibility of increased noise if you get a canister filter, and you will also have to make an investment in time to learn how to setup and maintain the filter. A canister filter is going to be great if you do have a big tank. 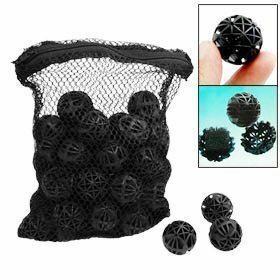 If you aren’t ready for the investment of time and money, however, you might want to stick with smaller filters for now. All of the “06” style canister filters have a tall, sturdy appearance. The black plastic and red highlights are a good look, and the upright canister design allows the 306 to hold almost 50% more media than round canister filters of a similar size. The lift lock clamps are a good design addition, as they allow for secure closure of the unit. Combined with the locking nuts and rim connectors for the hoses, you’ve got a pretty tight system that cuts down on leaks significantly. 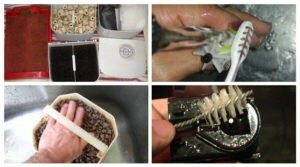 The filter feels like it will stay upright no matter what, and the plastic is firm and durable to the touch. Some filters I’ve encountered use cheap, wobbly construction materials but not the 306. While it is a tall unit, the weight is manageable at 15lbs. Light enough to move to the sink to do a bit of cleaning. The media baskets are impressively roomy, and will hold a wide range of options for chemical, mechanical, and biological filtration. You can mix and match for a custom clean to your water. The total media filter capacity is 6.94L, compared to 3.36L on the 106, 4.84L on the 206, and 8.94L on the 406. The included hoses are a made of a durable ribbed plastic and have a 1/2″ inside diameter. 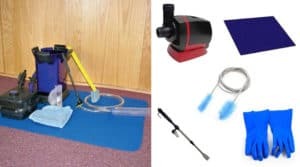 You can use non-ribbed hoses if you prefer, and without much in the way of customizing the hoses to fit the unit either. You can get a nice glimpse of the 306, and it’s components here. If you’ve used a canister filter before you already know the drill: the instructions packaged with your device are inadequate, and you will have to turn to prior experience (or YouTube) for assistance. At least taking everything out of the box is simple. From there it’s a matter of assembling the unit and getting the motor into place, and then getting your hoses prepped and in place. As noted, the included hoses are sturdy, but not difficult to work with when doing your initial setup. The hassle comes in when you are trying to position the hose output in the appropriate place in your tank. Priming can be tricky, but taking some preliminary steps like filling your filter with dechlorinated water before priming and double checking all your locking mechanisms can go a long way to easing the process. Once your filter is on, give the priming pump a few pushes, and you should be good to go. With the exception of some of the awful noises it might make during the priming sequence, this filter is very quiet. I had to double check to make certain it was actually working a few times. As long as you have the filter sealed up properly, noise is not going to be an issue for you. If a seal is giving you some hassle, a bit of petroleum jelly usually does the trick as a short term fix. The pumping power is not exaggerated. Even with media in it keeps on going at a high rate, and the redesigned impeller on the “06” models keeps going at a nice steady pace. This model has an intake strainer that helps reduce potential clogs, and a wide mouth for rapid water siphoning. There are adjusters for varying the flow rate, and the 306 has an “Aqua-Stop Valve” that enables users to disconnect/reconnect hoses without breaking the vacuum seal. Speaking of the filter media, the 306 comes with some pre packaged options. 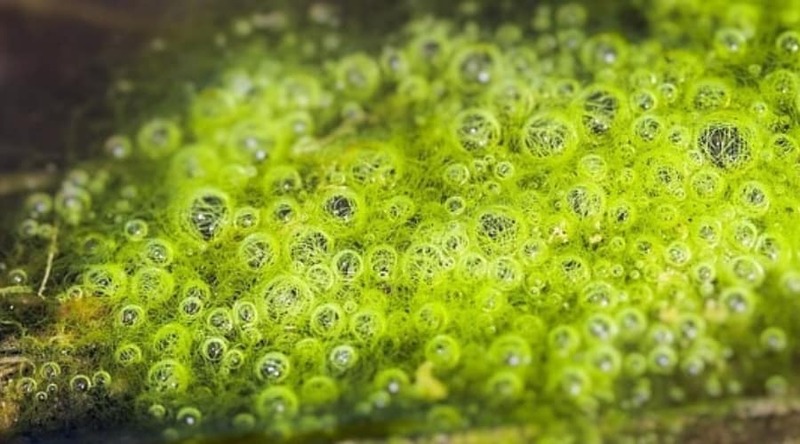 Firstly, the “Fluval Bio-Foam” which achieves biological and mechanical filtration by straining out tiny particles, and allowing a large welcoming surface for beneficial bacteria. The “Water Polishing Pad” increases mechanical filtration abilities by trapping debris, while the standard foam blocks work to filter out waste. Carbon filters come standard and help remove odors and discoloration from tank water without raising phosphate levels in the water. The 306 also comes with Fluval branded BIOMAX media, which are small ceramic cylinders that allow for even more colonization by good bacteria. Check it out in action here. Cleanup on the 306 can take a bit longer than other filters as the process is more involved. After unplugging the filter and disconnecting the tubing, you’ll have to clean all of the component pieces and the media separately. You’ll also want to take special care with the impeller, as it’s ceasing to function would mean the end of your filter. Are you sitting down? This filter is a bit higher on the price scale. You’re getting a lot, however, in terms of power, features, and durability. If you’re happy with the additional investment required to upgrade to a high quality filter, then this might be right up your alley. If not, there are alternative models out there that may fit your budget better. You will, of course, have to go through assembling the unit again, but it should be easy the second time around, and priming should be faster as well as long as you follow the previous advice. A step by step cleaning tutorial can be viewed here. The SunSun 4-Stage Canister Filter provides a comparable level of power in a smaller and less expensive package. It’s good for tanks up to 100 gallons, handles up to 370 GPH, has three big media trays, and even includes a UV light filter. All this and it still is a great price. The catch, you ask? It’s even harder to figure out than the Fluval, on account of the almost non-existent instructions. Once you get it going, however, it’s a snap, as it has a self-priming pump that eliminates the need for manual operation. Some report this model as being less sturdy, but by and large, it works well. Good for someone who requires the power but has to be a bit tighter with their purse strings. If you’re married to the Fluval name, but need something stronger, your immediate choice might be the 406 model. It’s got even more power than that SunSun but consumes less energy. It’s compatible with all the same Fluval media you’d be using, and has all of the same bells and whistles as the 306. 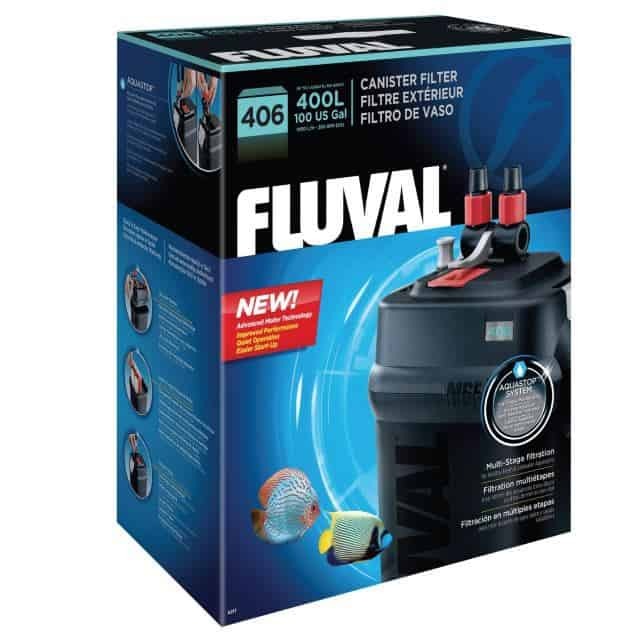 A little more on the expensive side, the Fluval 406 canister filter might be right for you as it combines high power with high quality and all the perks. 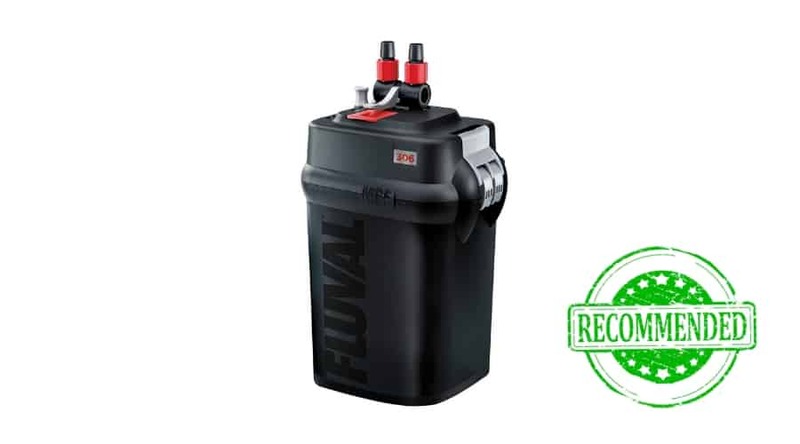 The market for canister filters seems to be ever increasing, but if you’re just starting to dip your toe in the pond, the Fluval 306 is an excellent way to get started. 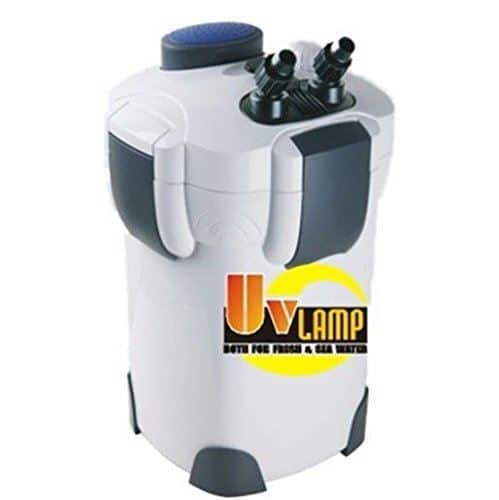 Though the operation is a bit more complicated than some other models available, you’re sure to get a durable unit that will have more than enough power to keep the water in your larger tank crystal clear and healthy.